Recently, the Department of Water Resources Sustainable Groundwater Management Program released a draft Best Management Practice (BMP) document that focuses on Sustainable Management Criteria (SMC) for public comment. This BMP characterizes the relationship between the different sustainable management criteria and describes best management practices for developing these criteria as part of a Groundwater Sustainability Plan (GSP). 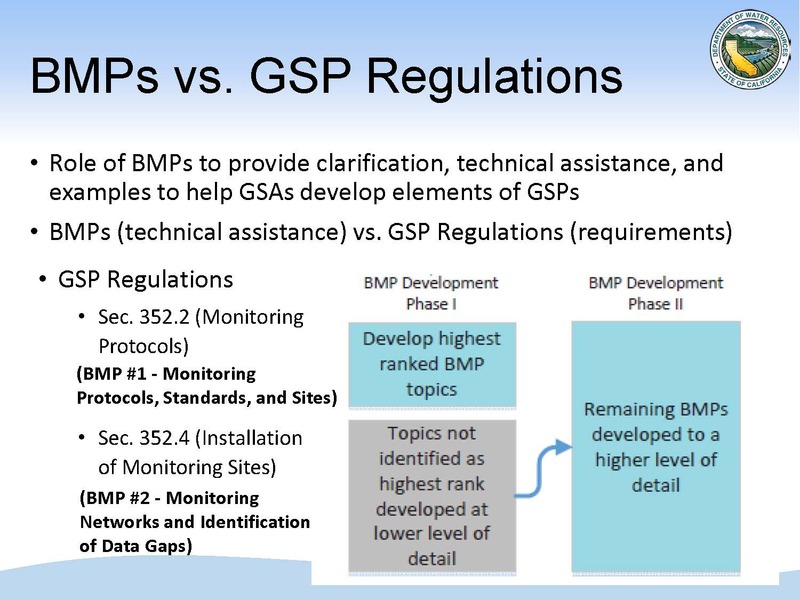 This BMP does not impose new requirements, but describes best management practices for satisfying the requirements of SGMA and the GSP Regulations. A series of public meetings was held across the state in early December; Department staff provided an overview of the draft document, answered questions, and took public comment. DWR staff also discussed the development of a new online tool for GSP notifications, and provided information on points of contact in DWR’s regional offices. Trevor Joseph, Senior Engineering Geologist with the Department of Water Resources, began the meeting with an overview of the draft best management practice document. Prior to SGMA, groundwater management was voluntary and more of a carrot approach, meaning that those who produced groundwater management plans were eligible for state grants and other opportunities, he said. However, it was only semi-effective as many plans didn’t cover the entire groundwater basin or subbasins, and there was various levels of implementation of plans. The Sustainable Groundwater Management Act passed in the fall of 2014 and became effective January 1st, 2015; the Act set out a specific set of requirements for sustainable groundwater management to avoid State Water Board intervention in high and medium priority basins. The Act assigned new authorities to Groundwater Sustainability Agencies, and gave the new agencies 20 years to reach sustainability. The local agencies or Groundwater Sustainability Agencies (GSAs), which need to develop Groundwater Sustainability Plans (GSPs) to avoid undesirable results and achieve sustainability within 20 years. The Department of Water Resources will evaluate the groundwater sustainability plans and provide assistance to the GSAs. The State Board is the enforcing agency who will intervene in the event that local agencies are unable to reach sustainability. High and medium priority basins must comply with the Sustainable Groundwater Management Act in order to avoid State Board intervention, identified on the map as those basins shown in yellow and orange. Mr. Joseph noted an important distinction between the GSP regulations and Best Management Practices. The GSP regulations lay out the specific requirements for the information that the Department needs to see in the GSPs for evaluating whether or not a basin is sustainable; these requirements are not optional. However, the Best Management Practices (BMPs) are technical assistance; they are optional. The GSAs can choose to use these BMPs if they want, but they do not have to. There is somewhat of an exception with respect to monitoring of groundwater basins. Mr. Joseph noted that there is a requirement in the GSP regulations that with respect to monitoring, a GSA must either have their own BMP or they must adopt the Department’s BMP. Accordingly, the Department completed two BMPs last year, one on monitoring protocols and the other on monitoring networks. The Department has already produced five technical best management practices as well as other guidance documents, including information on water budgets, modeling, and stakeholder engagement. To access those documents, click here. The sustainable management criteria is described in sub-article 3 of Chapter 5 of the Groundwater Sustainability Regulations, which describes all the requirements that local agencies or GSAs need to address in their groundwater sustainability plans. There are four terms discussed in sub-article 3: sustainability goal, undesirable results, minimum thresholds, and measurable objectives. 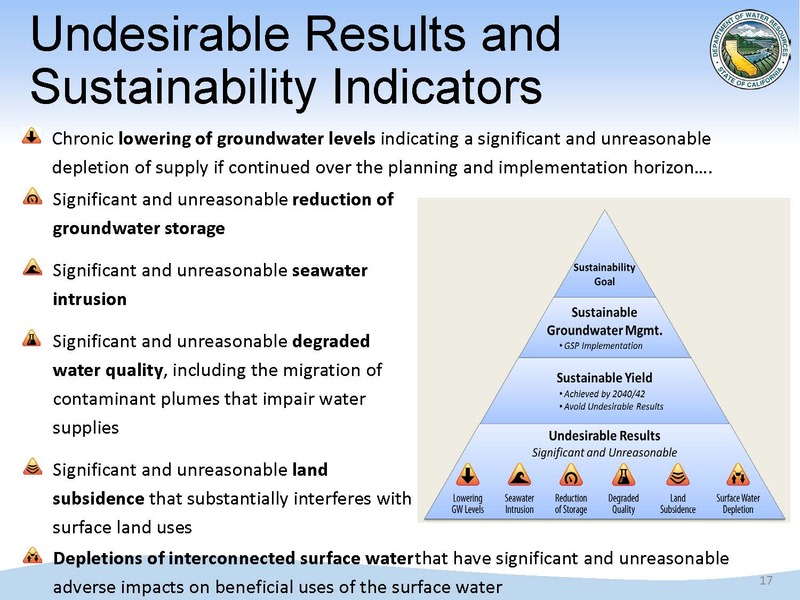 Mr. Joseph presented a slide listing the undesirable results: chronic lowering of groundwater levels, reduction of groundwater storage, seawater intrusion, degraded water quality, land subsidence, and the depletions of interconnected surface water. He reminded that the pyramid concept is a way to think about those requirements and the avoidance of undesirable results. 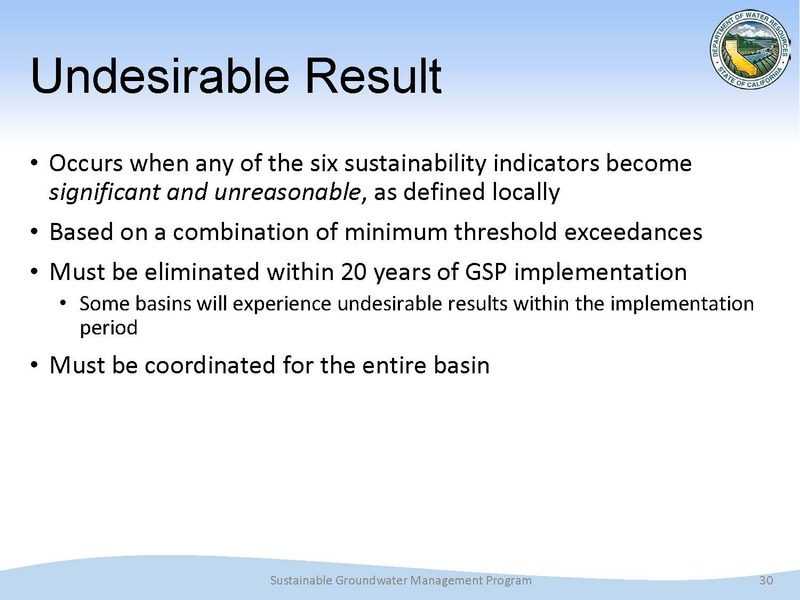 Avoiding the six undesirable results are a key requirement in SGMA to show sustainability in a basin. Sustainability indicator is a term used in the GSP regulations. It is defined as any of the effects caused by groundwater conditions occurring throughout the basin that are considered significant and unreasonable and that cause undesirable results. “The key here is that sustainability indicators are those effects caused by groundwater indicators; they are only undesirable results when it’s significant and unreasonable,” he said. The draft BMP document is organized into three sections. First, it identifies some preliminary activities, such as understanding the basin setting, inventorying existing monitoring programs, and engagement with interested parties in the basin. 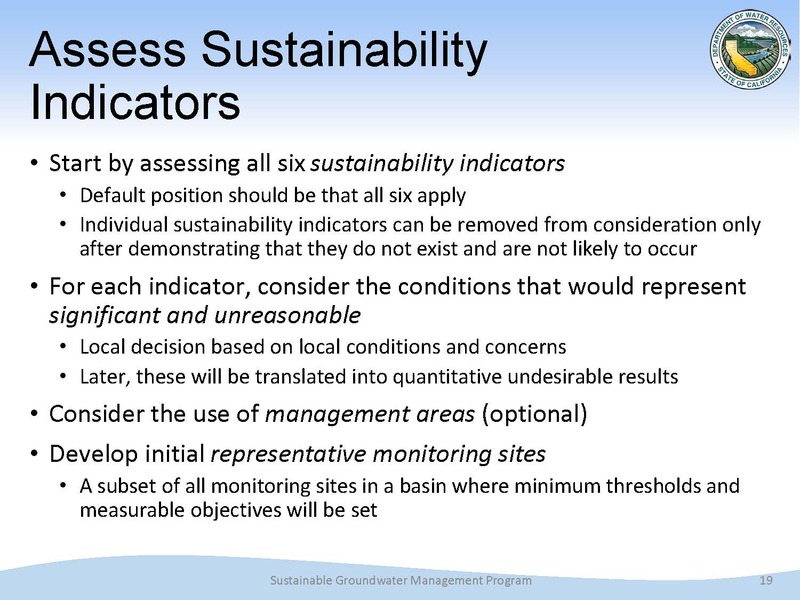 Next, the draft BMP discusses assessing sustainability indicators. All six sustainability indicators need to be assessed unless information can be provided that demonstrates why a specific indicator does not apply. An example of that might be seawater intrusion; if the basin does not have coastal access or the ability for saline water to intrude into the basin, than that sustainability indicator would not apply. He noted that there is a responsibility for the GSA to describe or demonstrate why a sustainability indicator doesn’t apply in a given basin. The next step is to consider the conditions for each indicator that would represent significant and unreasonable. This is a locally driven process, and ultimately the GSA is responsible for describing what is significant and unreasonable in their GSP. A GSA might want to consider the use of management areas, which is an option for local agencies to define areas of their basin differently, as there may be different considerations or different ways to set up monitoring. The use of management areas is optional. Next step is to determine minimum thresholds. 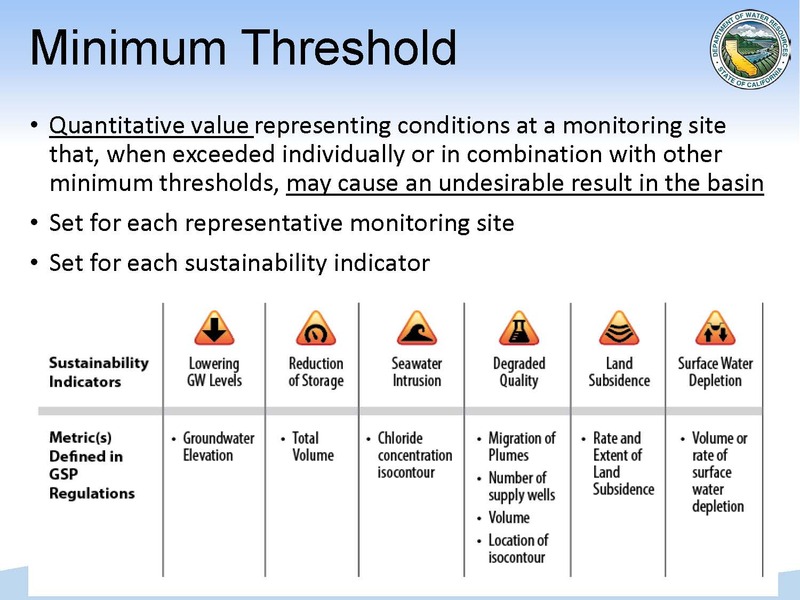 A minimum threshold is defined as a quantitative value at a given monitoring site that may cause undesirable results in the basin. Mr. Joseph explained that undesirable results (or lack thereof) are what identifies sustainable conditions in the basin, and the tool that is used to define undesirable results is minimum thresholds. Seawater intrusion: chloric concentration isocontour. Degraded quality: migration of plumes, number of supply wells, volume or location of the isocontour. Land subsidence: rate and extent of land subsidence. Surface water depletion: the volume or rate of surface water depletion. The information criteria that was used to set those minimum thresholds. The relationship between the minimum thresholds for each sustainability indicator. How the minimum threshold potentially aids in avoiding causing undesirable results in adjacent basins. The effects to interested parties or beneficial users and uses of groundwater or land uses and property interests when setting that minimum threshold. How the minimum threshold relate to state, federal, or local standards. Mr. Joseph noted that it does not need to match state, local, or federal standards; GSAs can decide to use a different threshold, but they would need to include a description on how that relates to the applicable state, local, and federal standards. Mr. Joseph then went through an example using the sustainability indicator of chronic declining groundwater levels. 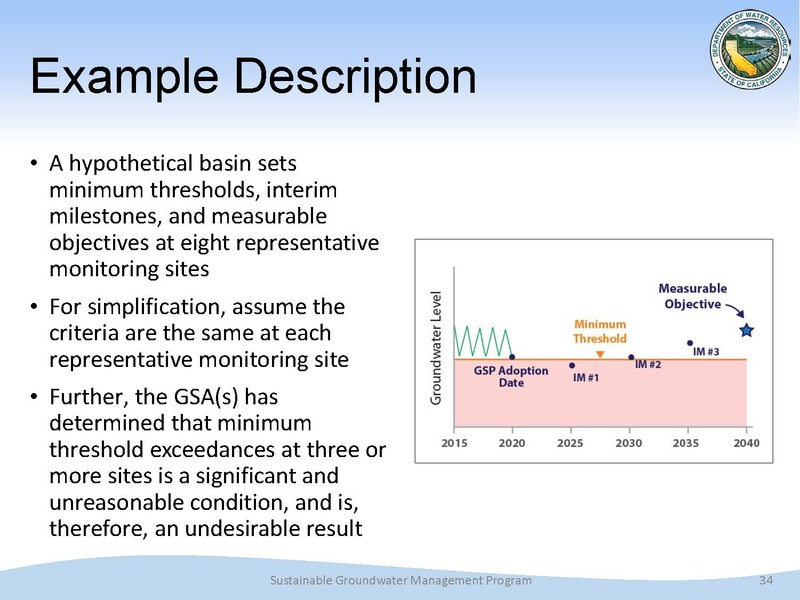 He presented a diagram of a hypothetical basin (below, left) that shows the minimum threshold for one representative monitoring site in the basin. He noted that on the diagram, the groundwater level dips below minimum threshold in 2022, but then comes back up. The draft BMP document identifies a series of things to be considered and discussed with stakeholders when setting up minimum thresholds. For groundwater levels (above, right), those include historic groundwater conditions, screen intervals for wells, and the average, minimum, and maximum depths of wells. 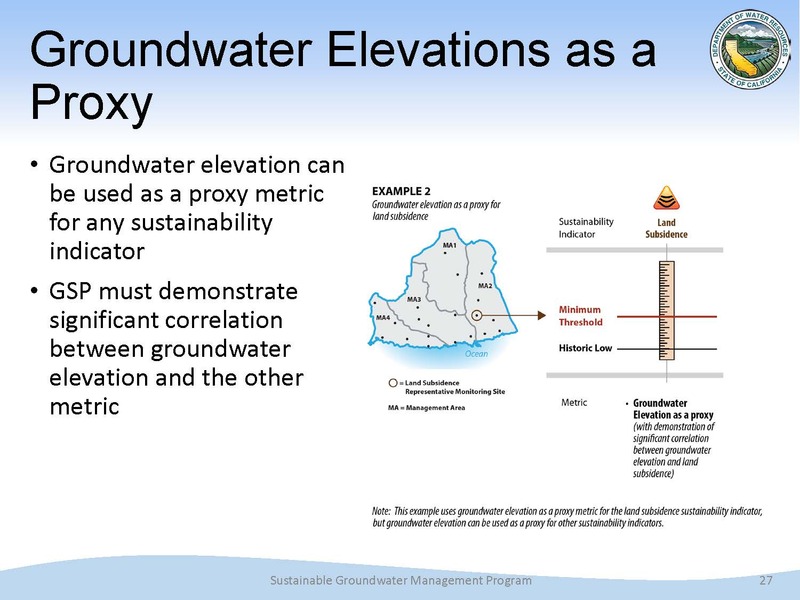 Mr. Joseph noted that groundwater elevations can be used as a proxy for other metrics when setting up sustainability indicator minimum thresholds, however in doing so, the GSP must demonstrate the significant correlation between groundwater elements and other metrics. Measurable objectives and interim milestones are also addressed in the draft BMP document. Measurable objectives are somewhat similar to minimum thresholds in that it is a quantitative value at a specific site, he said. Mr. Joseph noted that GSAs won’t be penalized for not achieving the measurable objective, because the measurable objective is not what defines undesirable results in the basin; undesirable results are defined by minimum thresholds. Interim milestones are progress points at five-year intervals that represent the measurable groundwater conditions that the GSA hopes to achieve during the 20 year implementation period. 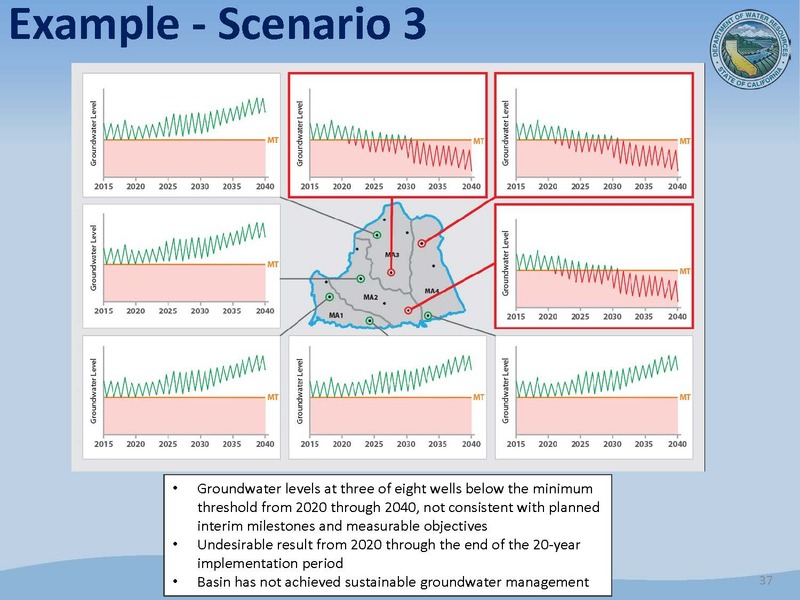 In the hypothetical example (above), the GSA recognized that groundwater levels might go lower for a period of time on their interim milestones, but ultimately the GSA hopes to meet the measurable objective, which in this case is after 20 years, the measurable objective is for groundwater levels to be roughly equal to what they were on the date the GSP was adopted. 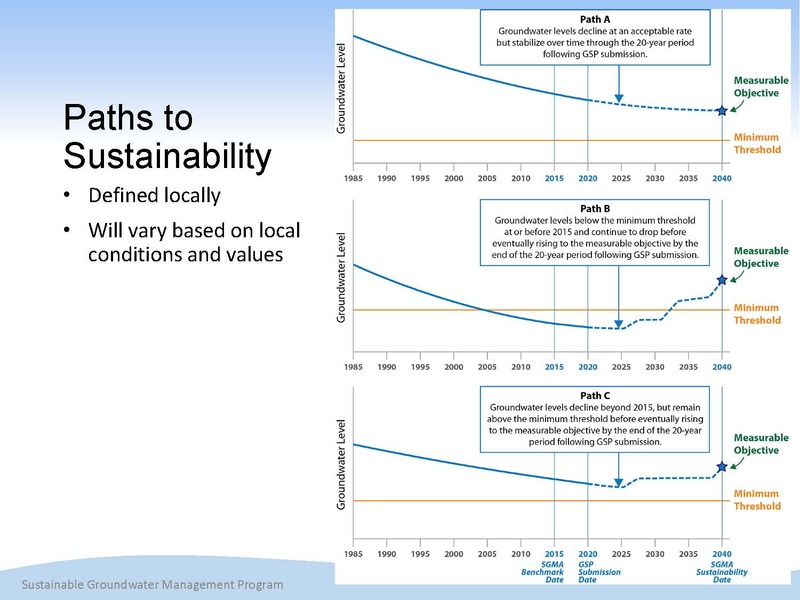 There are different paths that can be taken to sustainability, Mr. Joseph said, presenting a slide with three graphs depicting groundwater elevation. 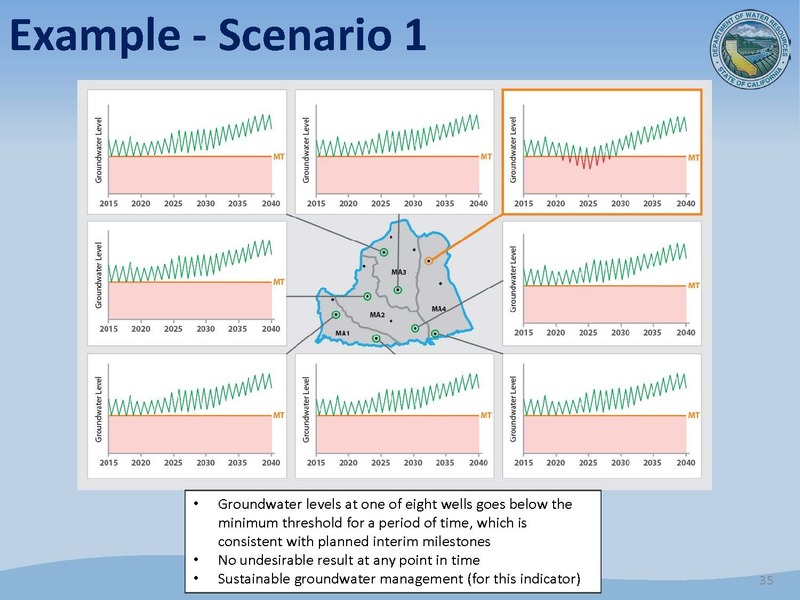 In path B, groundwater levels in this example were well below the measurable objective when the plan was adopted, but the GSA has made incremental progress in an almost step-wise fashion to achieve that measurable objective over time. “That’s okay; the key here being that it’s always above the minimum threshold,” he said. In path C, groundwater levels decline beyond 2015, but remain above the minimum threshold before eventually rising by the end of the 20 year period. The sustainability goal culminates in the absence of undesirable results within the 20 year period, he said. In the draft sustainable management criteria BMP, there is a description of the sustainability goal and the information that should be included in the plan, including the information that was used to establish the goal, a discussion of the measures that will be implemented, and an explanation of how the goal will be achieved within 20 years of the GSP implementation. Mr. Joseph then gave a more detailed example, emphasizing that this example is to articulate the relationship between minimum thresholds, undesirable results, and sustainable management; it is hypothetical and intentionally simplified. In this example, there are eight representative monitoring sites, but this will vary by basin; it is up to the local agencies to define the appropriate number of representative monitoring points needed, as well as the minimum thresholds and a description of undesirable results. In the example, there are eight representative monitoring sites; the hypothetical GSA has defined undesirable results as the exceedance of minimum thresholds at three of their representative monitoring sites. Mr. Joseph then presented a slide showing the eight representative monitoring sites. In the first scenario, groundwater levels at one of the wells goes below the minimum threshold for a period of time, shown in red below that pink line. However, this is consistent with the plan interim milestones. In this example, the GSA has identified undesirable results in the basin as the exceedance of three minimum thresholds, and so even though the one well is below the minimum threshold, there are no undesirable results at any point in time in this example. In the second scenario, three wells do go below minimum threshold in the period between 2020 and 2030. 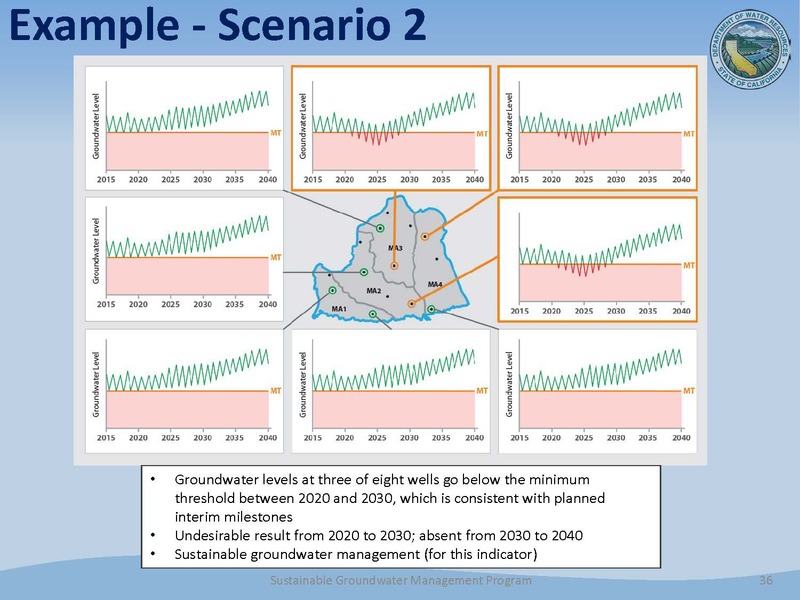 In this hypothetical scenario, the GSA has determined that the exceedance of minimum thresholds at three monitoring locations is an undesirable result; however, it’s between 2020 and 2030, but it’s consistent with the plan interim milestones and consistent with the way the GSP document was designed and so there are no undesirable results in this example at the end of the 20 year implementation period. In the third scenario, there are undesirable results as defined by three minimum threshold exceedances. However, in this scenario, the undesirable results have continued to exceed the minimum threshold throughout the implementation period, so by the end of the 20 year implementation period, undesirable results essentially occurred right after the plan was adopted and continued to occur until the end of the 20 year implementation period. Question: For the larger groundwater basins, there may be 20 or more representative monitoring sites. With five of the different sustainability indicators, minimum thresholds, measurable objectives, and describing your undesirable results times the amount of information … it starts to add up to a very, very large chapter in an already large complicated document, so what level of detail are you expecting? Question: I appreciate where DWR is coming from because of variability on not being prescriptive, but in advising clients, one of my issues is how do we evaluate what is going to be adequate without further guidance? How does the Department set itself up for not being called arbitrary when the groundwater sustainability plans are evaluated? Follow up question: Looking out into the future then, you’re showing future conditions, how would you advise clients to try to envision those future conditions and test their thresholds and limits and operating assumptions without actually modeling a water budget? Can you do this without a model in forecasting out into the future? Steven Springhorn then gave an overview of the Groundwater Sustainability Plan (GSP) Initial Notification System that the Department is developing. 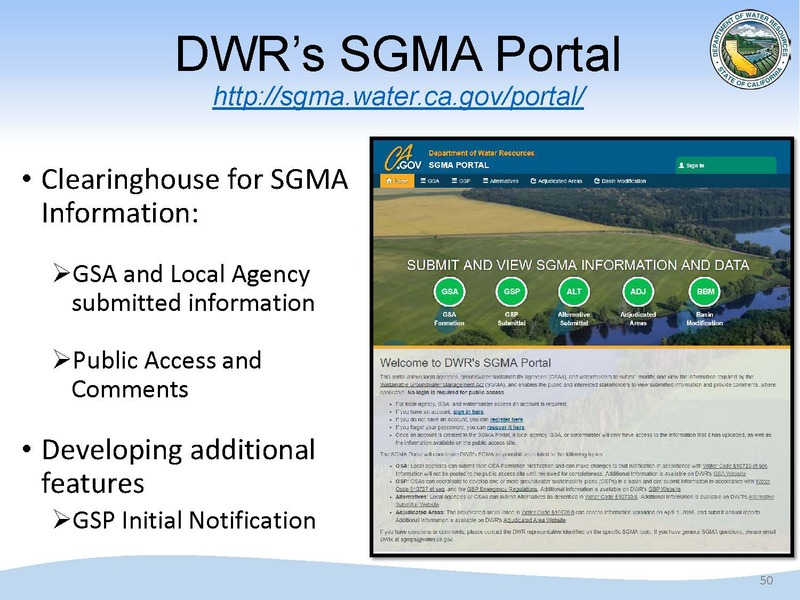 DWR’s SGMA portal is the clearinghouse for all the reported information received related to SGMA. 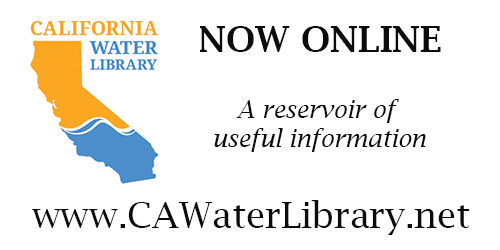 All the information received from Groundwater Sustainability Agencies and other related entities are available here; the public can also review documents received and comment on those documents. There is also information on Basin Boundary Modifications, Adjudicated Reporting, Alternative Information, and GSA Formation. The website is being expanded to include GSP Initial Notifications, and eventually submission of GSPs as well. 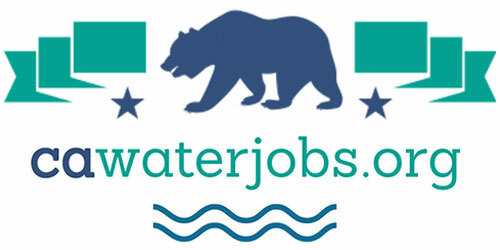 Per the legislation, GSAs are required to notify DWR in writing prior to initiating the development of a groundwater sustainability plan; the notice needs to include general information about the GSA’s process for developing the GSP and how interested parties may contact the GSA and participate in the development and implementation of that plan. The GSP initial notification also initiates public comments as required by the Act, as well as other requirements such as establishing and maintaining a list of interested persons in the development of the GSP and providing a written statement to the legislative body of any city or county within the GSP’s boundaries. So far, 25 GSAs have already submitted GSP notifications to the Department. 22 GSAs have been submitted for 17 basins or subbasins; Mr. Springhorn said the difference in the numbers is due to multiple submissions for the same basin where multiple plans are going to be developed. DWR will be working with those GSAs who have already submitted their notifications to transfer over to the new system. Once the Department receives the notification, the notice must be posted online within 20 days. For the public, the tool will provide a list of all initial notifications received; the ability to comment will be provided. A notification of public comment will be emailed to the Department as well as to the GSAs that submitted the initial notification so they will be made aware of the public comments that are received. There is a map showing where all these notifications are being submitted. To submit a notification, a login will be required, because only GSAs are required to submit initial notifications. There will be a short form that will include questions such as is the GSP planned for the whole basin or multiple GSPs, which GSAs will be part of those plans, boundaries of GSPs, points of contact, point of contact, information how other local agencies and stakeholders can get involved in the GSP preparation, and a link to the website where that GSP information for that basin will be posted. A FAQ is being developed and an instructional webinar planned; the system will be live in January. Existing notifications will be transferred over and that will allow for public comments to be attached to those notifications. Mr. Springhorn noted that there isn’t a public comment period per se on the notifications and so those will remain open; however, once the GSP is adopted and the plan is submitted to the Department, there will be a 60-day comment period that will be initiated once an adopted plan is submitted to the Department. The Department of Water Resources has set up specific points of contact at its regional offices that will be available to answer questions related to setting up these requirements. Trevor Joseph noted that they won’t be able to tell you what point or value to set minimum thresholds and measurable objectives, but they can help people further understand these requirements and explain the BMP document or the GSP regulations. 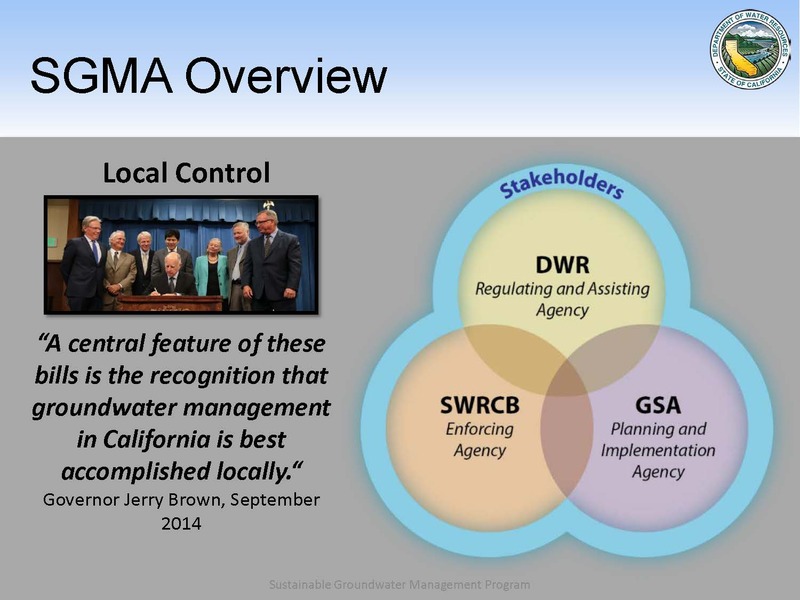 The contact will coordinate DWR’s local assistance and engagement programs, handle day to day correspondence, answer general questions regarding SGMA requirements, and assist with technical support and assistance. As the GSP development progresses, when basins have more complicated questions, the Department will bring subject management experts to meeting to address a basin’s unique issues. DWR staff will help with technical support, facilitation support, regulatory issues and informing them of requirements and grant opportunities. The points of contact will also attend board meetings and technical advisory groups for the basins, and they will efficiently route questions to appropriate managers and experts. For a PDF of the points of contact at DWR’s regional offices, click here. Public comments on the draft document are due by January 8th, and can be emailed to: sgmps@water.ca.gov Subject: Comments on Draft SMC BMP, or comment by US Postal Service to P.O. Box 942836 Sacramento, California 94236-0001 Attn: Lauren Hersh, Rm 201. Any comments received will be posted on DWR’s Public Comments – Best Management Practices webpage. For the draft BMP document on Sustainable Management Criteria, click here. To access all BMPs and guidance documents, click here. 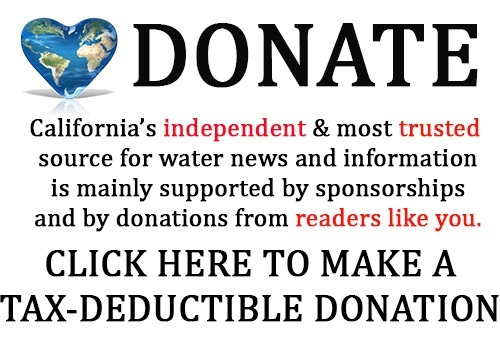 For DWR’s Sustainable Groundwater Management Program webpage, click here. To learn more about groundwater, visit the Notebook’s groundwater page.